I was messaged and asked to provide a comment and my work to journalists who had used this account as a resource for their article. As requested I emailed adverts, now long expired, from my database. They chose not to use my comment. Here it is in full. 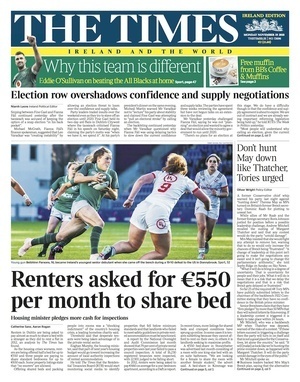 Posted in Misc and tagged Dublin Rental Investigator, Times Ireland edition at 1:09 pm on November 19, 2018 by Bodger. Oh no diddy! It’s all good apparently. Immigration, even illegal immigration benefits us all in some vague way. Nothing to do with keeping wages down and rents up, oh no. It’s only keeping high end wages down in the IT sector apparently. That’s why those nice IT companies are here of course. Nothing to do with our wild west irresponsible and selfish tax regime. No pressure on public services either, no, in fact the health service would be even worse apparently. It’s not globalism at all because well the Irish Times says so. Oh and superannuated, left wing economists who were consistently wrong prior to the financial crash. Quite a few of their brainwashed foot soldiers here will be along to admonish you shortly. Doing jobs the Irish don’t want to do etc. Never mind the exploitation, on all sides, feel the diversity. Are you honestly blaming housing shortage problems on immigrants as opposed to say, I dunno, total mismanagement by an FG government and no increase of public housing for 30 years? Who is brainwashed? irrelevant. why invite thousands of students into a city to be exploited like animals. because big biz want cheap labour. Very much a two-tier market at play. 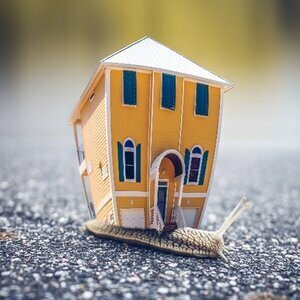 Those of us renting and lucky to be in long-term tenancies with decent landlords are somewhat protected by the 4% p.a. rent increase cap. 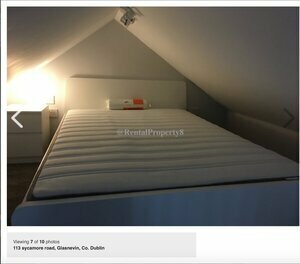 This means my double room in D6 is €650/m (sharing large house with 3 other professionals, all with own double rooms at same rent per room) – yet this is only €100-200 more p.m than the shared beds quoted here, which may also be in less desirable and less safe properties and areas? 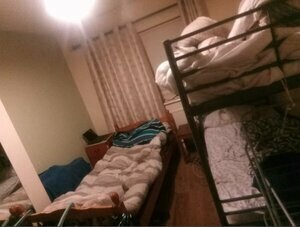 I knew it was bad out there in Dublin for those looking for rooms, but this is bonkers! I’m very much with Fr. McVerry when he claims the current FG government is “ideologically opposed” to providing real solutions to the housing crisis. Fair play @RentalProperty8 for drawing attention to the ads and the regulations, you’re providing some service. Must be infuriating for the Times Ireland to ignore your comment while exploiting your unpaid work. You might find some consolation in the fact you have nearly as many followers as the Times Ireland sells full-price papers. 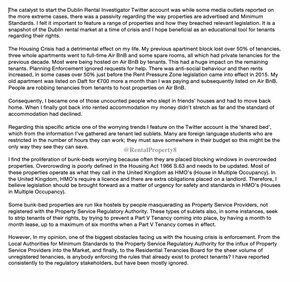 It is doubly infuriating when the SF housing spokesman pushes out a press statement in response to the Times Ireland story today. Where is he when you’re tweeting the most outrageous housing conditions in Ireland in 2018? 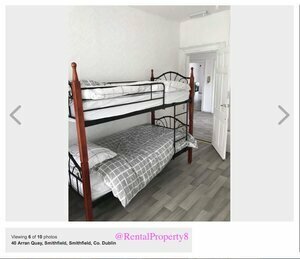 I recommend everyone give @RentalProperty8 (Dublin Rental Investigator) a follow on Twitter; he/she/they are providing incredible coverage. Good work @RentalProperty8 – keep it up. This issue needs to be highlighted and socialized. 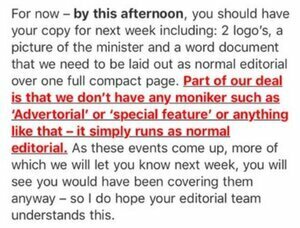 No surprise that the Sunday Times or other MSM does not credit you with any contribution. That’s par for the course. Now, if *you took some of the *their ‘research’…. whinge, moan, paywall, etc. etc.